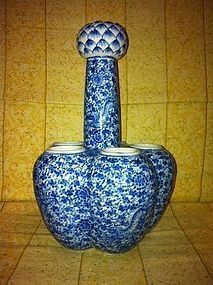 A Chinese blue and white porcelain tulip lotus vase Including five short ovoid vases encircling a central cylindrical stem with lotus bud mouth, decorated with grass dragons among leafy branches. Late Qing. Measure 25 cm in height.